Try our Natural Selenite Specimens Satisfaction Guarantee - compare our prices and our superior quality. Click on any selenite specimen image below to enlarge it. 7.4" long x 2.3" x 1.3"
This 7.4 inch long selenite crystal has completely natural surfaces. This natural selenite crystal has very good internal transparency with some encrusted surface areas. This selenite crystal also exhibits swallowtail twinning, visible in the right side of the photo as the V-shaped features at the base of the crystal. 8" long x 3.5" x 2.4"
This natural selenite crystal has completely natural surfaces. It is semi-transparent to transparent. 10" long x 2.2" x 0.9"
This 10 inch long selenite crystal has completely natural surfaces. It is transparent in the upper half and slightly bent in the middle, and it is semi-transparent in the lower half with some encrusted surface areas. 22" long x 3.7" x 3.5"
This 22 inch long selenite crystal has completely natural surfaces. It was mined in the Henan Province of China. It has superb transparency throughout its length. There is some snowy selenite still attached at its base. 3.75" long x 3.4" x 2.8"
This natural selenite rose formation consists of intergrown blade-like selenite crystals. 8.25" long x 0.9" x 0.6"
This split satin spar selenite measures 8.25 inches long and has beautiful silky luster or sheen along its surfaces. It is semi-transparent and transmits light from one end to the other. 16" long x 2.7" x 2.4"
This split satin spar selenite measures 16 inches long and has beautiful silky luster or sheen along its surfaces. It is semi-transparent and transmits light from one end to the other. 18" long x 3.9" x 2.2"
This split satin spar selenite measures 18 inches long and has beautiful silky luster or sheen along its surfaces. It is semi-transparent and transmits light from one end to the other. 19.5" long x 4" x 2.7"
This split satin spar selenite measures 19.5 inches long and has beautiful silky luster or sheen along its surfaces. It is semi-transparent and transmits light from one end to the other. 11" tall x 5" x 4.8"
This split satin spar selenite specimen stands up 11 inches tall, and it has a very beautiful silky luster or sheen along its surfaces. It is semi-transparent and transmits light from one end to the other. This specimen was base-sawn so that it stands up as shown, and it was also core drilled inside the bottom (see bottom view photo), so that a light could be inserted into the base of this selenite specimen to make it "glow" in a dark room! 12" tall x 4.5" x 4.5"
This split satin spar selenite specimen stands up 12 inches tall, and it has a very beautiful silky luster or sheen along its surfaces. It is semi-transparent and transmits light from one end to the other. 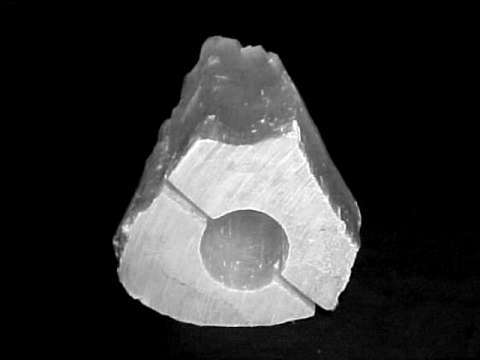 This specimen was base-sawn so that it stands up as shown, and it was also core drilled inside the bottom so that a light could be inserted under the base of this selenite specimen to make it "glow" at night. This is the end of our Selenite Mineral Specimens page. To see more selenite photos, just select another item category from the table below. To see photos of another mineral variety, select any item category link in our Mineral Inventory & Factsheet Index. Would you like us to inform you when we add on this page more natural gypsum specimens and selenite crystals? We have a large inventory of natural gypsum and selenite specimens in stock, so be sure to let us know if you have any selenite special requests. Please contact our webmaster or our 'site' geologist with any questions or comments.